Historic Yanqing left behind many ancient villages. Having experienced the vicissitudes of time, they bring a bit of color to the land of Guichuan. Yongle (title of Zhu Di, Chengzu of Ming) reign of the Ming Dynasty was the last booming period in the grand opening to the outside when Zheng He launched the sea voyages and Yongning Town was established. “The influence of Yongning, a place of affluence wild with joy anywhere in a hundred-li radius, extends to the east”. Yongning, its name conferred on the significance of “Everlasting Peace” from Zhou Shu (Book of Zhou), faces the Thirteen Imperial Mausoleums of Ming, with Jinyun Mountain on the other side. In the 12th year of Hongwu of Ming, Yongningwei was established. In the 28th year of Hongwu of Ming, five military areas, Liaodong, Xuanfu, Datong, Yansui (Yulin) and Ningxia were established. In the 7th year of Yongle, the Imperial Mausoleum was built in Tianshou Mountain. In the 12th year of Yongle, the Emperor issued an Imperial Edict to set up Longqing Prefecture. In the following year, Yongning County was set up, with authority over Jinshan County. In the 19th year of Yongle, Emperor Zhu Di moved the capital from Nanjing to Beijing. In the 5th year of Xuande of Ming, General Xue Lu and his troops went in search of a spot for Yongning. The town was built the following year. When the office of County Magistrate Liu Rui was completed, Yongning County moved to the town. The significance of Yongning, which was in the northern end of the North-South axis of the Imperial Mausoleums of Ming, was great. In the 5th year of Chenghua, Yongning was stationed by East Commander of Xuanfu Military Area. The Commander office was erected in Yongning, which had become a critical town in the eastern Xuanfu Military Area standing guard over a vast territory south to Juyongguan, north to Dushikou, east to Huoyan Mountain in Sihai Town and west to Longqing. 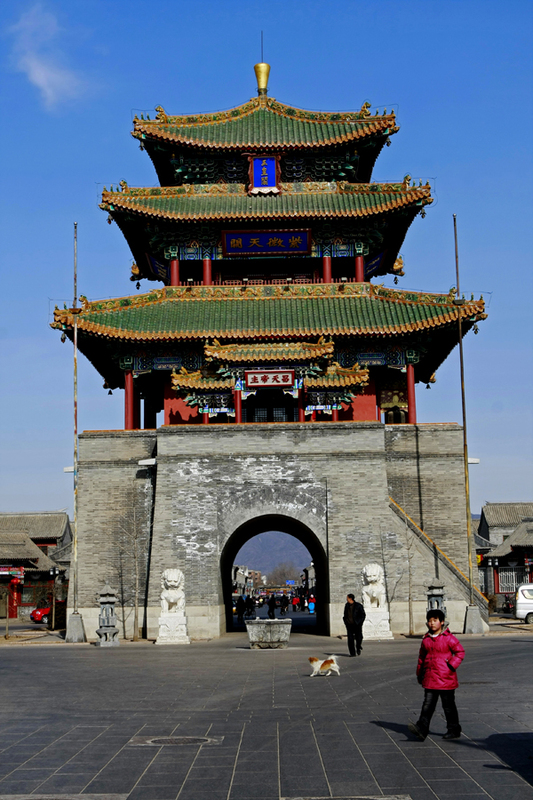 The military castles in Ming Dynasty came in five levels, Zhencheng, Lucheng, Weicheng, Suocheng and Baocheng. Yongning was the first Lucheng in the eastern Xuanfu Military Area. As a military center, Yongning had critical military defensive significance. At the time, Yongning County, Yongningwei and Longqing Zuowei were under the jurisdiction of Yongning Town, which had over 8,000 officers and troops. In the 22nd year of Jiajing Reign, Yangtou Mountain to Sihai Huoyan Mountain section of Great Wall was built. To intensify defense of the capital and the Imperial Mausoleum, Nanshan Road was set up. This trace of Great Wall retains within the boundary of Yongning County. During the Jiajing reign, a campaign of looting took place in Yongning. In late Ming period, the ground military defense of Yongning Town was drawn tighter. The ancient town Yongning, a farmland of Han Chinese and a place for Shanrong, the Huns, Khitan, Jurchen nationalities to tend the livestock, had gradually been of regional cultural characteristics featuring the mixture of nationalities. The ethnic minorities in Yongning Town consisted mostly of Manchus. In Ming and Qing Dynasties, out-of-towners flocked to Yongning, making it a place in which Han Chinese and Manchus congregated. Yongning was ninety li away from Huoyan Mountain in the east, thirty li away from the Imperial Mausoleum in the north, forty li away from Yanqing Prefecture in the west, and thirty li away from Jing’an Bao. In Ming and Qing Dynasties, General Mansion, Yongning Wei, Longqing Zuowei and Yongning County were under the jurisdiction of Yongning Town with an intense aura of Yongle culture.